The Skeptic's Field Guide: Hunting Humbug 101 Podcast! What with all the crazy newfangled technology about these days, we thought we'd get in on this podcasting business. I believe we will be the first ever "Fallacycast"! 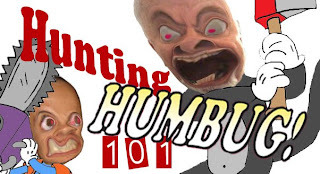 Here's the link to direct download the inaugural podcast: What is humbug?.mp3 and subscribe here: http://huntinghumbug101.podbean.com/feed/. We'll endeavour to post a pod once a week and will eventually get around to covering all our fallacies and humbug hunting techniques. Here's the link to the post most of this discussion is based around - Fallacy.